Area 202 is situated in the southwestern precinct of the temenos. Its present appearance is mainly characterized by a large, modern shopping mall. Already in 2012, during the construction of the mall, the left half of a limestone offering table was found within the modern debris. 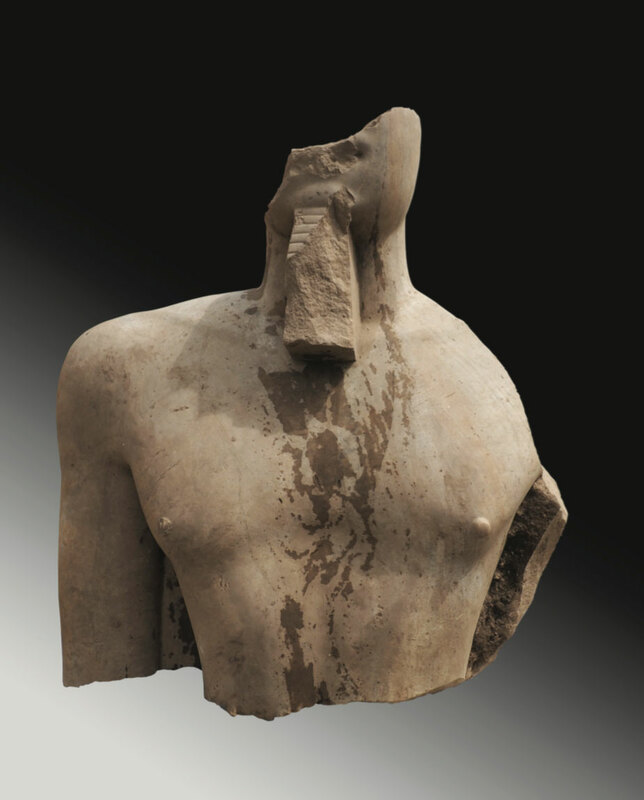 Thus, the Egyptian-German Mission started excavating small trenches in the area only a few months later, during which many more objects – mostly fragments of relief decoration or of door posts, but also the missing joint of? the offering table – were discovered. However, none of the objects was found in situ. They were all discovered in layers of modern debris. In addition, none of them fitted into the archaeological context of a temple area. The scenic motives featured on the reliefs as well as the ritual embedding of offering tables in the funerary cult are indicators of their original provenance: the New Kingdom necropolis of Heliopolis. But how did they find their way from the necropolis into the temenos area? The Heliopolitan necropolis of the New Kingdom is located in the eastern forefield of the temenos area. 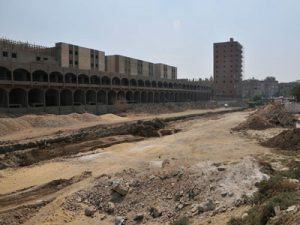 Nowadays it is almost completely overbuilt by the modern district of Ain Shams. 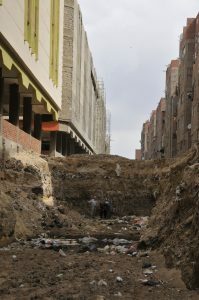 Due to the construction of the Higher Polytechnic Institute in the late 1950s, extensive construction work took place in Ain Shams and thus also in the terrain of the ancient necropolis. Many freestanding tomb chapels – probably the necropolis’ predominant type of tomb architecture in the New Kingdom – were levelled and disassembled. The construction debris including the fragments of the tombs was brought to Matariya and dumped within the southwestern temenos area. For this reason, area 202 is covered with vast layers of modern debris in which fragments of New Kingdom tombs are embedded. During the New Kingdom, the necropolis of Heliopolis was one of the largest within the whole Nile Valley. Important findings such as the door lintel of a high official of Ramses III with the name Khaemwaset, the matching fragments of door posts belonging to Meriatum as well as the relief fragment of Itmw-Htp point to the prevalence of the freestanding type of tomb chapel, which was also popular in the Memphitic necropolis of the New Kingdom in Saqqara. In Heliopolis, four decorated tombs of this type can be distinguished so far: the tombs of Khaemwaset, Meriatum, Atumhotep and May. The person Khaemwaset is furthermore attested on the Papyrus Wilbour from the reign of Ramses V, which refers to him as the principal of estates of the mortuary temple of Ramses III in Medinet Habu. Therefore, it is most likely that Khaemwaset must have been resided in Thebes. Yet neither his lintel nor the Papyrus Wilbour show any connection to Heliopolis. 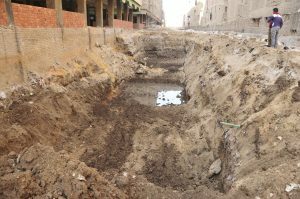 Although it can be assumed that Khaemwaset was born in Heliopolis and therefore also wanted to be buried there – being buried where one was born appears to be an especially late Ramesside trend – this can not be proven. The objects excavated in area 202 give new information about the New Kingdom necropolis. Since this part of Heliopolis will hardly ever be accessible for systematic excavations due to modern occupation, these objects are of particular/great interest for the entire site of Heliopolis and its history.